There have been several issues, in which owners of HTC One smartphones found their contacts were lost and haven't backed up the data on their Google account. Good thing there is Android Data Recovery utility. Android Data Recovery is a professional tool used to recover or restore contacts or phone numbers that have been deleted from the HTC device, purposely or not. This tool works by quickly scanning your HTC Deleted contacts like email addresses, names and contacts then restore them onto your computer. Step 1. 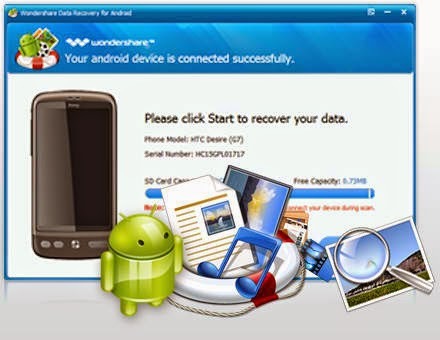 Download Android Data Recovery app and install it on your computer. Step 2. Connect your HTC One smartphone to the PC with a USB cable. Warning: Never pull off the USB during the entire process. Step 3. Scan your HTC mobile. Click the "Start" button to let the app analyze your HTC One device. Be sure to have at least 20% on your phone battery before scanning, in order to avoid interruptions in the later process. Remember that it will take a few minutes for the scanned results to be acquired. Once your lost data/contacts are shown, you may now stop scanning. Step 4. Once scanning is complete, choose/select the contacts you want to restore to your phone lists. Step 5. Click the “Recover” button to restore selected contacts and save them on your computer. You should now have your deleted contacts back to your HTC One device.